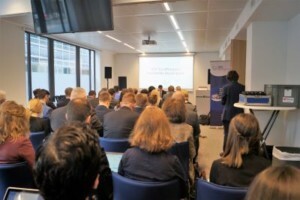 The CPMR’s Transport working group met in Brussels on 10 April to begin its key work to influence the review of the TEN-T Regulation. The meeting began with a presentation by Gudrun Schulze, Team Leader at the European Commission’s DG MOVE, who outlined the agenda of the review and its main goals. Each of the CPMR Geographical Commission then shared their interests and questions regarding the TEN-T Regulation. Political representatives from the Geographical Commissions stressed the need to remove the remaining bottlenecks to achieve the Core Network by 2030, the visibility of the Motorways of the Sea (MoS) and the enhancement of territorial accessibility. Representing the Commissions were: Mr Bosse Andersson (Baltic Sea Commission, Stockholm), Mr Felipe Pina (Atlantic Arc Commission, Cantabria), Mr Philip Smart (North Sea Commission, Aberdeenshire Council), Mr José Ramón Diez De Revenga (InterMediterranean Commission, Murcia) and Mr Xavier Ramis Otauza (Islands Commission, Islas Baleares). 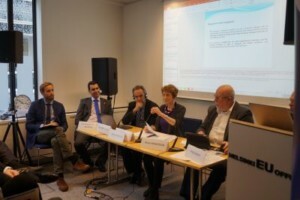 This meeting provided a basis for the CPMR to prepare its response to the Public Consultation that Ms Schulze announced will launch in late April, lasting 3 months. In the afternoon, the Working Groups welcomed French MEP Ms Revault D’Allonnes Bonnefoy, who provided a detailed presentation on the Mobility Package voted by the European Parliament in early April, and Ms Bocquet, advisor to Mr Pavel Telicka, Vice-President of the European Parliament, who presented the partial agreement on the CEF. Members Regions also discussed the CPMR’s next steps on aviation.